The lesson ideas can be adapted to suit children of different ages and math experience. Head out into the garden to see the sunflowers you are growing, or pick (or buy) some to bring indoors to investigate. 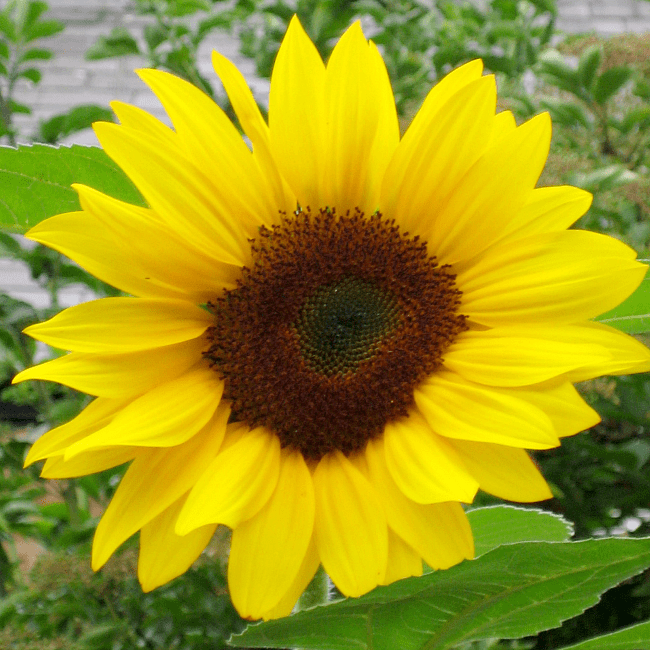 Let’s start by looking at the shape of our sunflowers. How would your children describe them? Can they see a circle around the outside of the petals? Can they see another circle around the outside of the seeds? Are all flowers the same shape? Which other flowers can they find in the garden that are circles? Which flowers are different? You might like to take it further and learn the names of different flower shapes. How big are your sunflowers? We have measured their height as they have been growing, and now that we have flower heads and seed heads we can investigate how big they are too. We can introduce mathematical language, compare sizes and go on to took at diameter, circumference, and measuring with units. You can adapt your lesson to suit your children – keep it as an interesting conversation about size with younger children, or take accurate measurements and make calculations with older children. Are your sunflowers all the same size? Which is the biggest? Which is the smallest? Can you line them up in size order? Can you think of something else that is the same size as your sunflower? Is it as big as…. a drinking glass, a saucer, a plate, your head? Why do you think some sunflowers are bigger than others? Which sunflower has the biggest diameter? 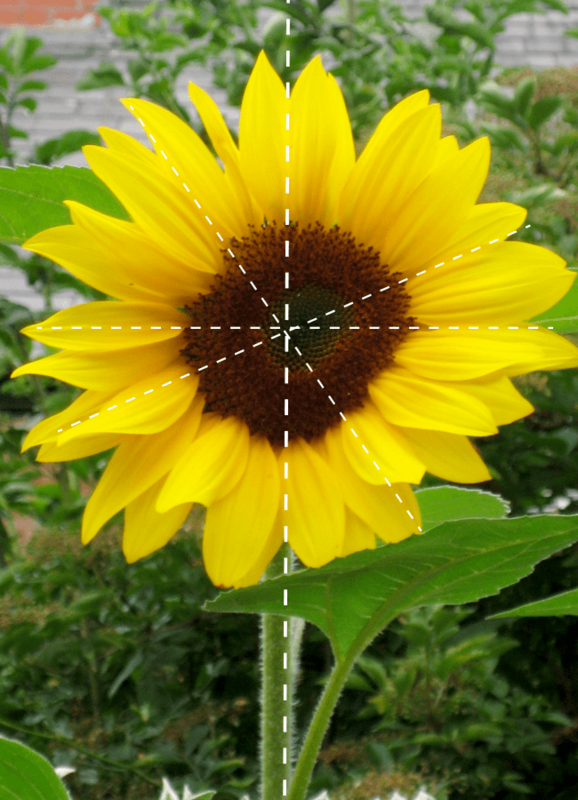 Do the sunflowers with the biggest diameter also have the biggest circumference? Older children might like to learn about pi and make their own calculations. If they measure the diameter of their sunflower, can they calculate the circumference without measuring it? When we begin to measure things with our children we don’t have to use rulers and tape measures. We can keep it simple at first and let them work with and understand the concept of length using other tools. These are called non-standard measurements and can be anything you want. 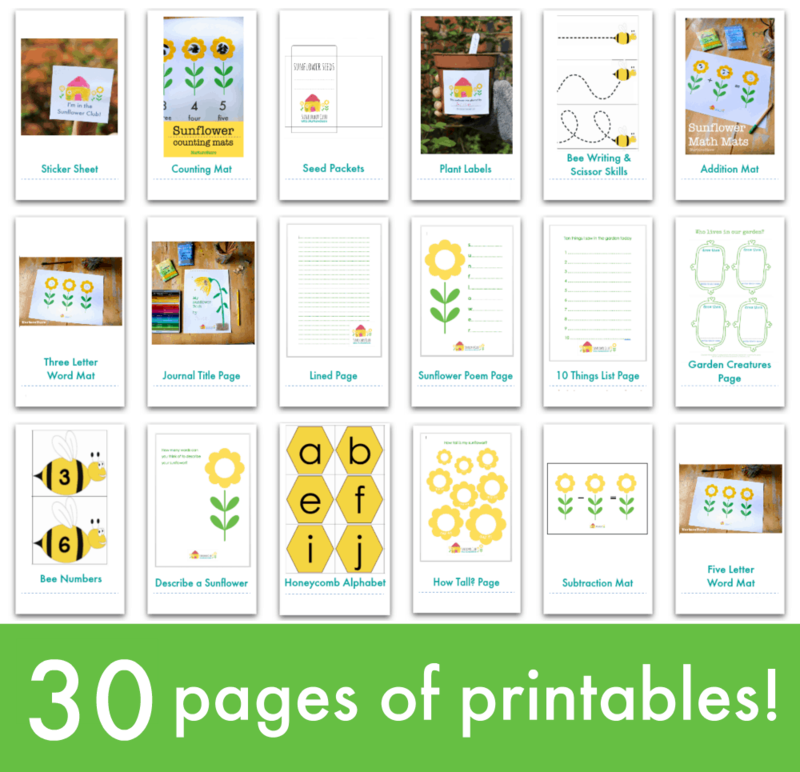 You might measure the diameter of your sunflower using leaves laid out in a line, pebbles, buttons, Lego bricks – anything! 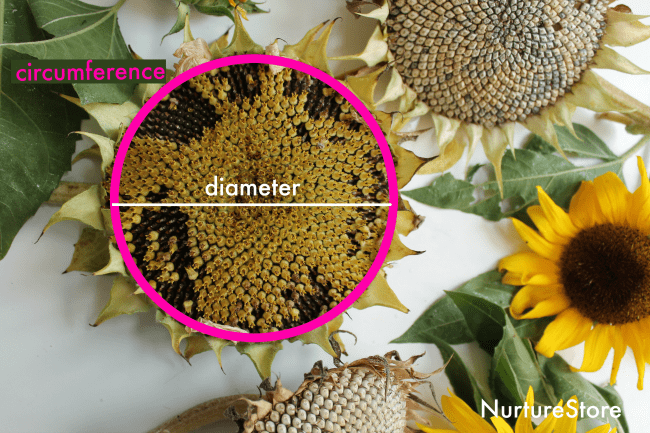 The key thing is use something that lets you have conversations about the length of your sunflower – giving you a language to use to consider each length and to compare them. With older children we can use rulers or tape measures to measure. You might talk about:Why do we have rulers and tape measures? Why not just stick with measuring with pebbles? Are you measuring in centimetres or inches? 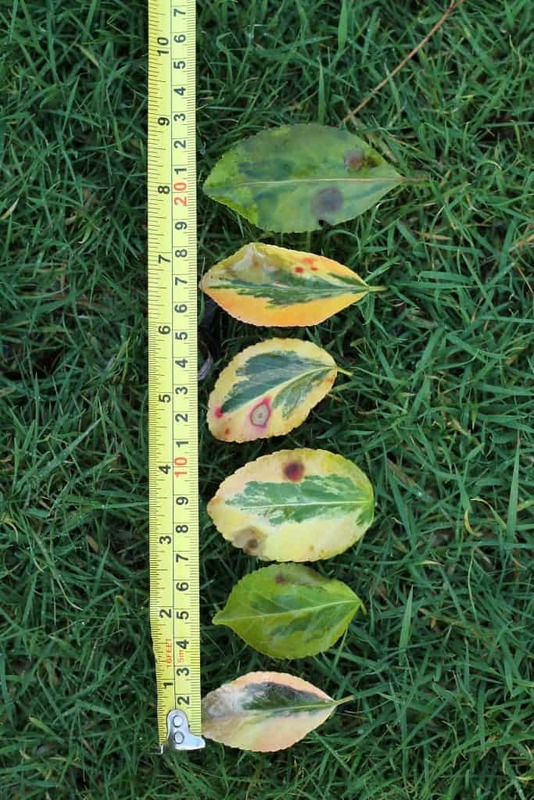 With either standard or non-standard measuring systems you might like to graph the results of your measuring and include your record in your nature journal. You could go on to calculate the average diameter of all your sunflowers. We can also use our sunflowers to explore symmetry. Symmetry is a similarity or balance between different parts of something. People, animals, and plants can be symmetrical in some ways. Ask your child to think about their body. Imagine drawing a line from the top of your head all the way down to the floor. Then think about what your body looks like on either side of that line. One side is more or less the exact same as the other: an arm on each side, a leg on each side, matching ears, matching eyes. Your body is symmetrical. Then think of the face of a cat, and imagine a line from the top middle of the cat’s head running down to its chin. Can you see symmetry here too? The cat’s face is balanced on each side of that line: two ears, two eyes, two nostrils, two sets of whiskers. It’s symmetrical. We can see lots of symmetry in nature. Have a look at your sunflowers. Are they symmetrical? Imagine a line from the top of your flower, down through the centre, to the bottom of the flower. Are the two sides of the flower balanced? The type of symmetry you can see here is called lateral symmetry, or reflection symmetry. It’s when you have two exact parts, like a mirror image. You might like to explore this idea through art. 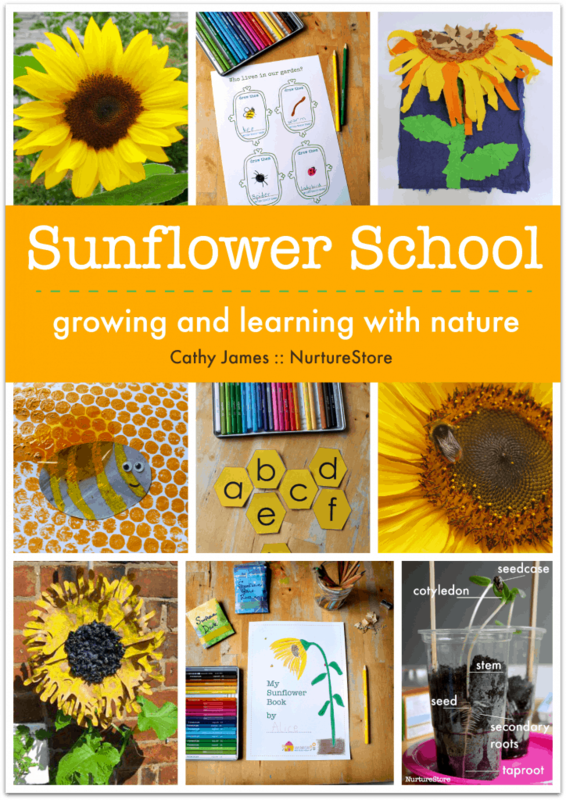 Draw a line down the centre of a piece of paper and on one side only, paint half of your sunflower. Then, while the paint is still wet, fold your paper in half, so the paint side touches the blank side, and press down all over the page to make a print. 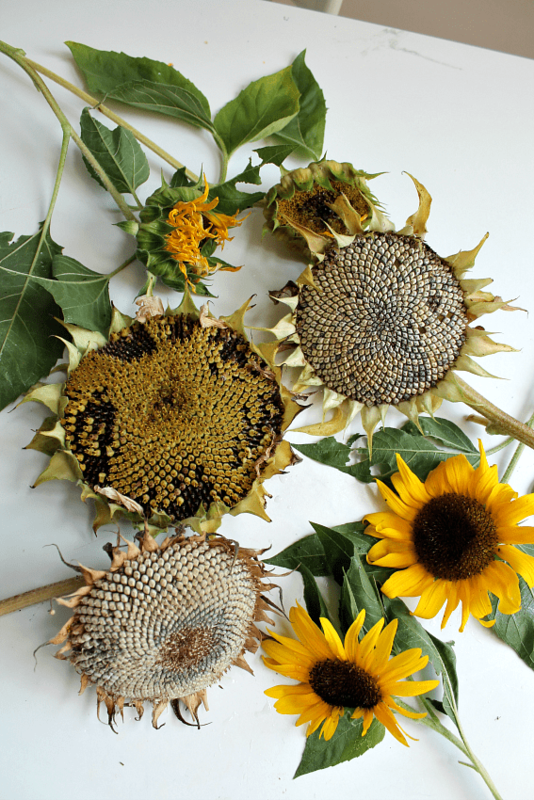 Carefully peel open the paper to reveal your whole sunflower: symmetrical on the two sides. In addition to using our flowers to look at lateral symmetry, you can also use them to explore radial symmetry. Radial symmetry is symmetry around a central axis. To look at this in a flower, imagine several lines across your flower. If you rotated your flower around it would match its position at each turn. Different flowers can have different numbers of lines of radial symmetry. You can see this well in the poached egg plants in the photograph above. Imagine five lines, coming out from the centre of the flower to the tip of each petal. Notice how each point of a petal is about the same distance from the next point. If you rotate the flower around, a fifth of the way round its circle each time, the petals fit into place at each turn. 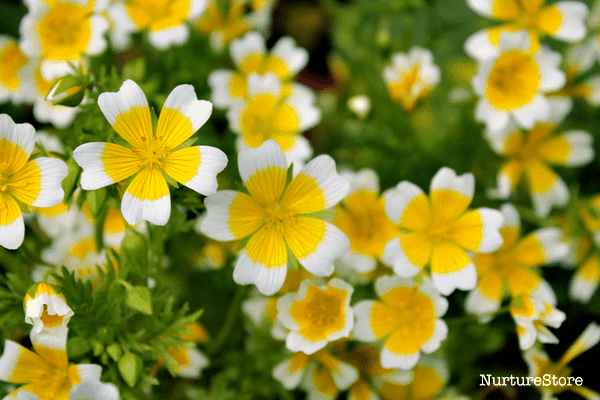 This is how radial symmetry works – with the poached egg plant having five lines of radial symmetry. 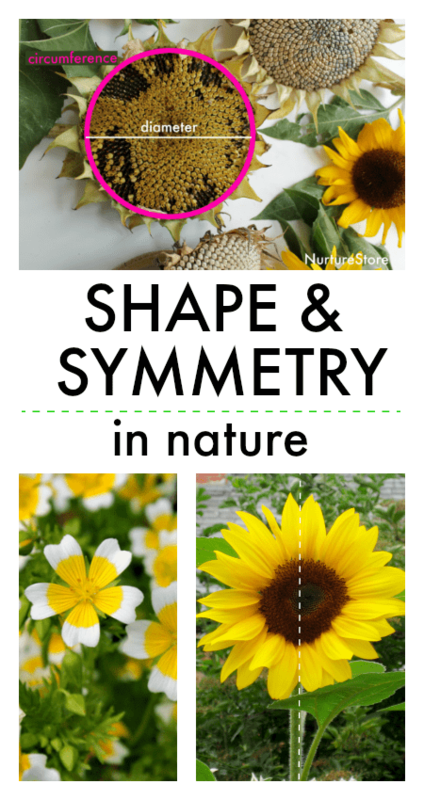 Go on a hunt around your garden and see if you have any other flowers that are symmetrical – with mirror symmetry or radial symmetry. And look out for wild flowers when you go on your next nature walk – how symmetrical are they?